I so loved this book! It's totally cute and if I ever have a daughter, I'd give this to her to read. I think this would have been one of those books I would have devoured again and again as a kid if I'd read it back then. Desi is a sweet girl, who, like so many girls her age, has a crush on a cute-but-a-bit-vapid boy she goes to school with. I know I had such a crush when I was 11. And probably more than one. Anyway, he is sort of dating her former best friend-turned-evil and this is a constant source of insecurity for Desi. I loved that she stays true to herself, even though she wants to fit in so badly. 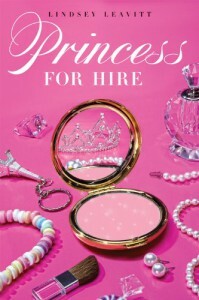 I loved the whole concept of princesses hiring substitutes! The subs use a special powder to turn them into an exact copy of the princess they are working for. What I would give to have one of those compacts! Wouldn't it be wonderful to just be someone else for a day sometimes and getting paid to do just that? Desi goes on 4 different jobs in the book and I loved how she dealt with the obstacles she got faced with. She really wants to make things better for other people and was very genuine. Sometimes she may not have thought things through, but that made it all the more fun to read about. I also really liked Meredith, her 'coach', she seemed bitchy at first, but she gradually warms up to Desi and I really liked the glimpse we get of her past. I'm really excited to be reading the next one, The Royal Treatment, soon! I'm looking forward to new subbing adventures and more of Desi in general.